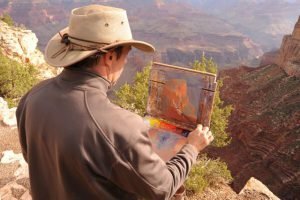 Not unlike the bugling of elk, the flocking of jays, and the switch to gold for the aspen leaves, the annual Celebration of Art has become one of the rites of autumn at Grand Canyon National Park. 2012 marks the fourth year for this plein air painting festival whose purpose is to further the understanding of the grandest of canyons, and to raise funds and support for a permanent art venue in the park. Twenty-six amazing artists will set up their easels from rim to river and turn out one compelling composition after another. Visitors can watch while they work and interact with the artists throughout the day. The September 8-14, proceedings will culminate in a “quick draw” competition and auction on the final day, and many of the works from the event will be on display in a free exhibit in historic Kolb Studio through November.